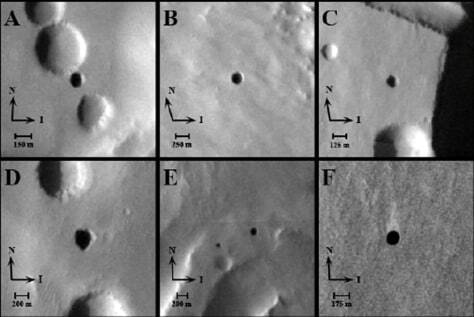 A THEMIS image showing entrances to possible Martian caves, dubbed the "seven sisters." Clockwise from upper-left: Dena, Chloe, Wendy, Annie, Abbey, Nikki and Jeanne. Arrows signify direction of solar illumination (I) and direction of North (N).